The latest Port of London Authority (PLA) safety campaign is looking to improve all river users’ awareness of how to share the river safely with smaller, vulnerable recreational craft on the tidal Thames. The campaign features seven posters focusing on themes including: the need for suitable lights and high viz clothing, being mindful of causing ‘wash’ which can tip rowers out of their boats, river positioning, lifejackets and being aware of river traffic density in central London. The posters are being progressively distributed to river users, rowing and other sporting clubs along the river. The next posters to be issued are: ‘Lost in the Urban Jungle’ and ‘Who you gonna call?’. 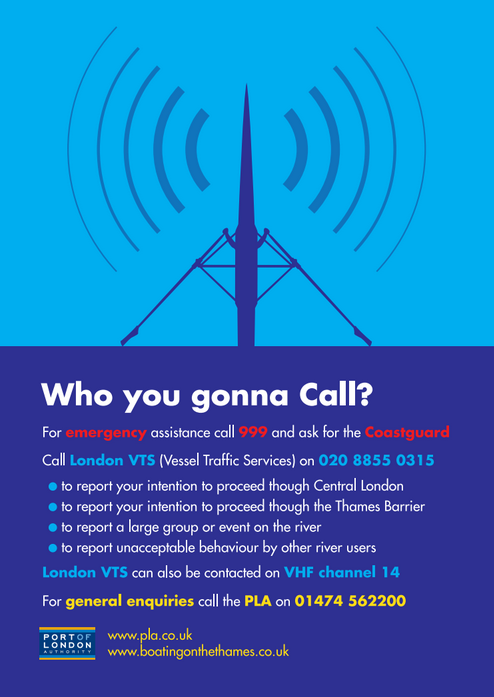 The latest PLA river safety initiative follows on from the ‘Lookout!’ campaign, developed with the Thames Regional Rowing Council and launched last year. The tidal Thames is 95 miles of river, running from Teddington Lock, through central London to the North Sea. The river is a thriving hub for sporting and recreational activities, with many thousands of people taking to the river every year and competitions including the Boat Race and Great River Race. The PLA is a self-financing organisation which runs the tidal Thames in trust for future generations. Our 350-strong workforce oversees safe navigation, protects the marine environment and promotes the use of the river. We have no shareholders and any financial surpluses are reinvested in stewardship of the river and improving the efficiency of our operations.